Jay Bruce Trade Weekend finally came and went after two years of run-up. Now we can turn the page on that era (or, if you’re like me, you can just mourn forever because who was more lovable than Jay Bruce and why should the Mets get him? WHY!?!). It also seems like a good time to take a look at what’s shaking out for the 2017 team. A while ago, I predicted the Reds will finish in second place next year. Nothing that’s happened has made me change my mind. The Reds have a fantastic minor league system right now and they’ve done a great job of acquiring prospects with high floors. There will be a different double play combo next year. Jesse Winker will get 500 PAs in the majors next year. Eugenio Suarez will play a lot somewhere. Nick Senzel will make an appearance. Suarez is such an interesting case. This year, the Reds asked him to play third, where he hadn’t played in a long, long, long, long time. And, predictably, he was kind of awful at it. Then in May, he didn’t hit at all. But lately, he’s been playing very well at third and his .762 OPS since June 1 makes him a slightly above average hitter. And he’s still quite young, having just turned 25, with a track record of being a solid offensive performer. Now, I don’t know where he’ll play, but I bet he’ll play somewhere. He may end up as the Reds’ version of Ben Zobrist as he can conceivably play 2B, 3B, LF, RF, and, in a pinch, SS. Whether he settles in anywhere depends on a couple of factors. The Reds have assigned Jose Peraza and Dilson Herrera to Louisville and it is pretty clear that they are regarded as the future in the middle infield. However, their plate approaches make them the most likely prospects to bust. That doesn’t mean, for the record, that I think they will bust, just that the possibility exists. It is very easy to imagine the Reds opening next year with Suarez at third, Peraza at short, and Herrera at second, but ending the year with Senzel at third and with Suarez shifted somewhere to the left. And then there’s the outfield. 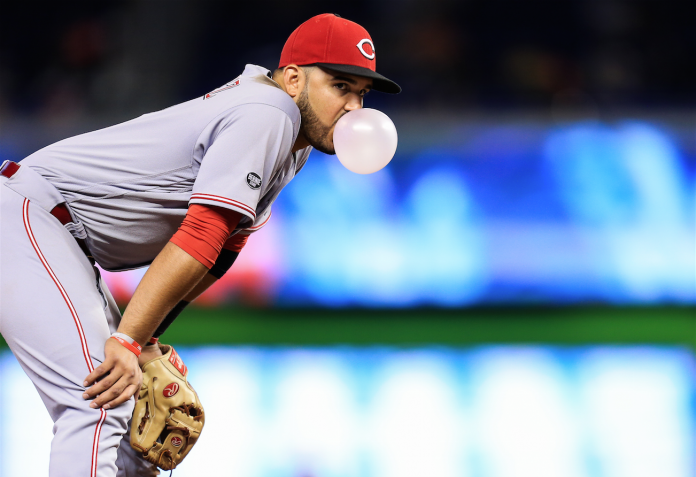 I’ve written about the Reds outfield recently, but for now, let’s just say you should watch Duvall and Schebler closely for these last two months. Winker is going to knock someone out of the picture eventually (Winker is five years younger than Duvall. This is a VERY important fact). He’s had some injuries this year, but has been hitting very well in Louisville lately and seems all but ready. The fun thing right now is that that is a really pleasing lineup on paper, and there is room for argument, but there are also no bad answers (unless some players show they don’t have it and the Reds insist on playing them anyway). I would expect the offense to be significantly improved next year, especially as high OBP guys like Winker and Senzel establish themselves. I haven’t even talked about the pitching yet, but look at the list of pitchers who could at least theoretically be in the rotation mix next year: Homer Bailey, Anthony DeSclafani, Amir Garrett, Cody Reed, Robert Stephenson, Brandon Finnegan, Michael Lorenzen, Raisel Iglesias. My goodness, the talent is coming, everyone. I’m telling you, it’s about to get a lot better in Cincinnati. I think it’ll be a long time before we see something as bad as the team we saw on the field at the beginning of this season.